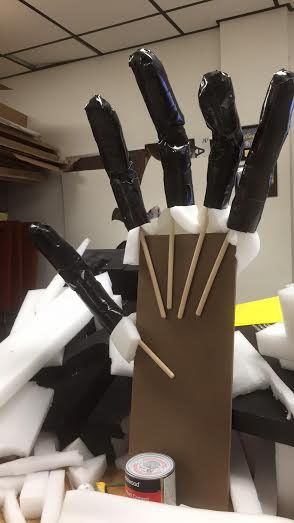 One of my favorite parts of doing live theater is building sets, props and costumes. "Man of La Mancha" is set in the 1600's in Spain during the Spanish Inquisition. It tells the story of knight errant, Don Quixote and his many crazy adventures. One of the standards of "Man of La Mancha" is a scene where he meets his principal rival "The Enchanter or the Knight of Mirrors." Most directors costume an actor in an elaborate suit of shiny army for the Enchanter but I knew I wanted to do something a little different. 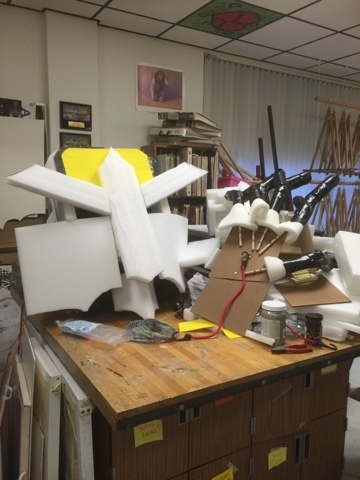 For my knight of mirrors I wanted to create a giant puppet and have the mirrors that eventually jolt Quixote back to reality come out of the puppet. This is the result of that plan. 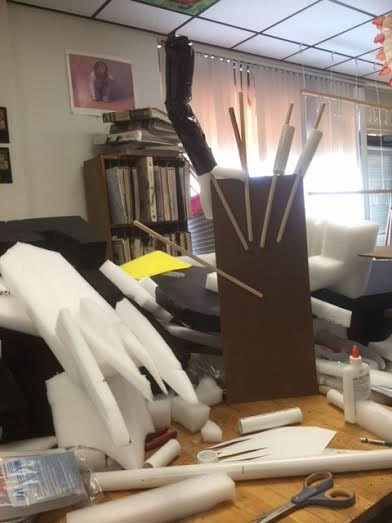 I had parts of this giant guy all over my classroom for weeks. I was thrilled when my cast finally got to introduce him to the audience. His eyes glowed. He had great personality thanks to the three puppeteers who manipulated him. He also filled the entire stage when he was fully extended. 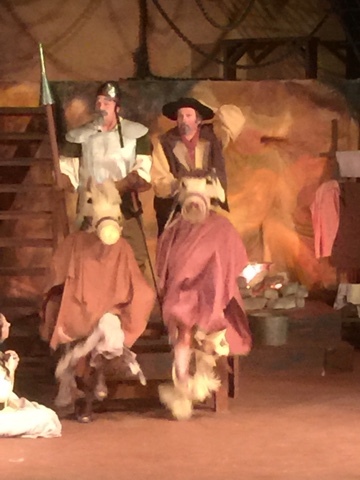 Another standard of "Man of La Mancha" are Quixote's horse Rocinante and Sancho's burro, Dapple. Directors approach these elements lots of different ways from stick horses to full costumes requiring two actors/dancers each. 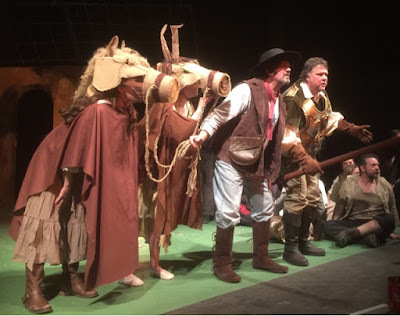 I think the strongest tradition of the horse and donkey is that they interact with other actors and perform a difficult, high kicking routine while Quixote and Sancho first set out on their quest. 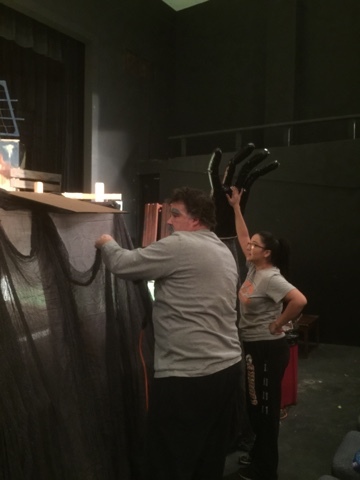 At the beginning of the musical, Sancho and his master are thrown into a Spanish prison. 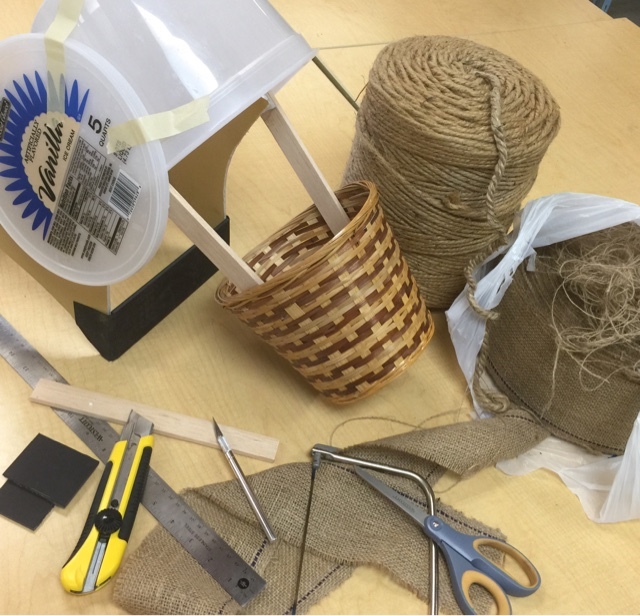 The only props they have to tell their story are found in a trunk that's brought with them. 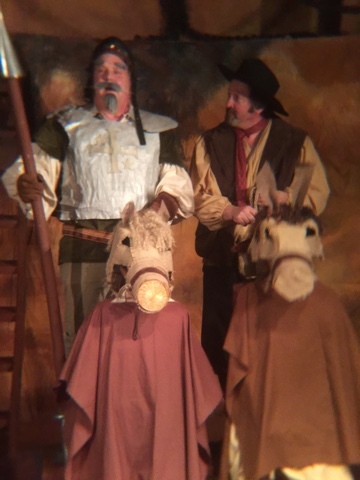 It was important to me to have the horse and donkey be props that looked primitive and handmade. I also needed to make the masks open enough so the two dancers inside could see to move around, on and also off the stage. I loved how my two dancer/actors brought these animals to life. They stole the show. One of my favorite plays. Wish I could have seen it, the set and costumes look amazing!